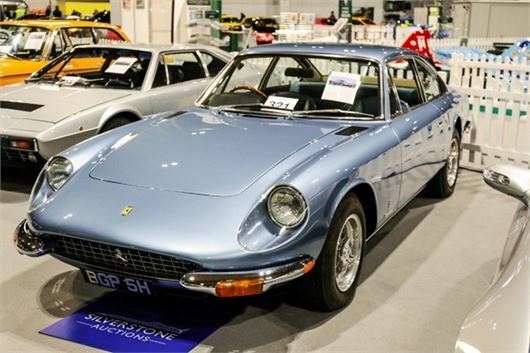 A 1970 Ferrari 365 GT 2+2 took top spot at the Autosport International auction over the weekend. One of 52 produced in right-hand drive, it was offered for sale for the first time in more than 20 years from a private collection. Finished in its original Azzurro Hyperion and superbly maintained by marque specialists, it sold for £200,250, including premium, at Silverstone Auctions’ first sale at the show. In total, 36 of 57 classic and competition cars offered were sold at the auction which took place at the NEC, Birmingham on 12January, generating combined total sales exceeding £2.6m. Post-Christmas financial exhaustion, a lack of consumer confidence within the wider economic climate and ongoing uncertainty over Brexit didn’t seem to cause any problems on sale day. Ten lots valued in excess of £100,000 were successfully hammered away. Furthermore, not only was the sale the first in the UK of 2019, it also marked Silverstone Auctions’ debut as the show’s new official auction partner. Other auction highlights included a 1990 AC Cobra Mk IV 'Lightweight', one of 21 genuine, alloy-bodied, lightweight examples in right-hand drive, was the subject of an extended bidding war between telephone and room bidders. The very rare and desirable V8 muscle car sold to a round of applause for £139,500 - almost £50,000 over its lower estimate. To see all the results from the Autosport International Sale visit silverstoneauctions.com.